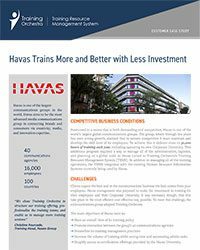 HAVAS, a leading communications firm with offices around the globe, believes in investing in the training their employees, but knew it had to be done in the most cost efficient and effective way. See how Training Orchestra’s Training Management System helped them streamline processes, monitor legal requirements, improve employee career training and train more… for much less! Read the case study.